Composed by Paul Burnell. 21st Century, Folk. Score, Set of Parts. 8 pages. Published by Paul Burnell (S0.195771). Optional: drone on low D throughout, performed by strings or organ, etc. ‘A Sable Brush Version of Moravian Folksong No.10’ was composed in 2013. Leoš Janácek composed the Fifteen Moravian Folksongs for solo piano around 1922. 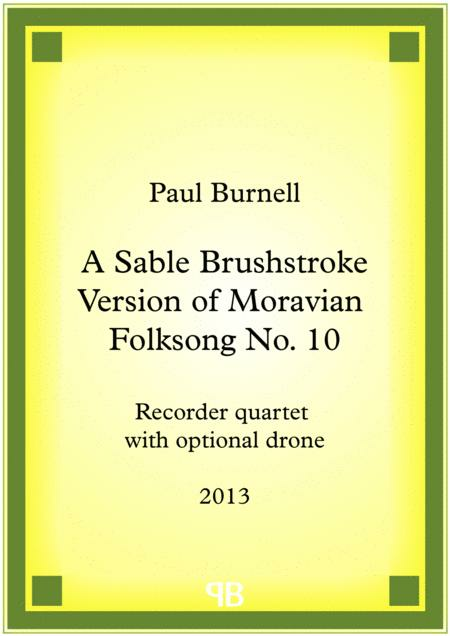 This piece is a 'sable brushstroke' interpretation of the tenth folksong for recorder quartet, with optional drone, which changes the original folksong melody.